Background: It’s been too long since we have seen Durham. It’s been a privilege to go on the road or the GO to see the teams and coaches of DRRD during this year [and seasons past and passed], both trackside at their new ACC venue and in their practice space within Coachella at Oshawa. DRRD has let me take in the lights and see what is possible without beating me up too badly. This weekend is special. Durham, this story is for you. 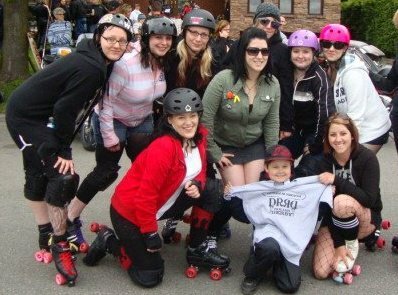 Durham Region Roller Derby does a good thing on Saturday, and honours the memory of a good fan and friend of the league, and in turns honours the spirit of Derby. The Second Annual Gibson’s Cup will be contested this weekend. This time around the clash for the Cup will be held in their newest home, the Ajax Community Centre, the ACC, so to speak. 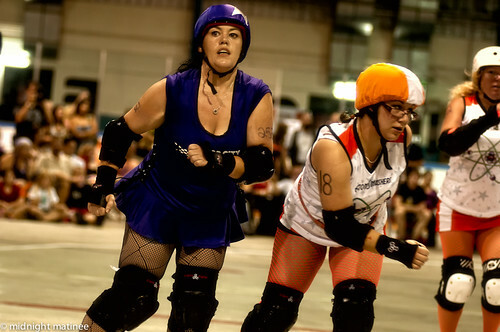 Does it seem that long ago when the league teams of Durham in purple or orange or blue farmers outfits were already going up against formidable foes from Kingston Derby Girls or Royal City Roller Girls? The point being the league has been squaring off against opposition as either the all-star representatives DRRDY Devils, or as the two home teams the Motor City Madames or The Atom Smahsers, or the DRRDY Farmers fresher meat team. 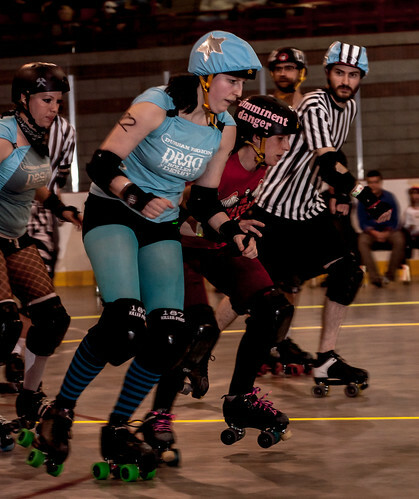 Leading up to the Cup has been a gruelling season of bouts, practice and dauntless spirit, overcoming all manner of Derby injuries and bruises on the track at home and on the road. Gibson’s Cup is DRRD’s one last chance this year for the two teams to finally smash each other. The culmination of the Durham season brings everyone in the league together all in the spirit of Gibson, yet marks the divide as the Madames and the Smashers go head to head for the only time in their schedule. Will last year’s winners Motor City Madames in purple be able to retain the Gibson’s Cup or will the Atom Smashers be able to hold it in their orange hands? It is only fitting that Sarah Cutsie Bootsie King [who will be wearing puple] has her say. “About two and a half years ago the members of the Durham Region Roller Derby league had the honour of meeting an 11-year-old boy who had unforunately spent most of his life battling terminal brain cancer. His name was Gibson, and he was a brave, witty kid who loved cars, motorcycles, loud music, and derby girls. “When asked to participate in a fundraiser for Gibson, The DRRD Girls jumped at the chance opportunity to get involved. Gibson was able to make it out to one of DRRD’s carwashes to show his support and help wash a few cars, not to mention spraying down a couple of the girls, but unfortunately he was never able to make it out to a game. After his long battle, Gibson lost his courageous fight against cancer in late October of 2010.